How can this city of natural wonders conserve its Hundred Caves? The answer is simple and clear: Develop it for eco-tourism. A five-year management plan for the protection and conservation of Hundred Caves, a potential eco-tourism site in Barangay Tagabinet, Puerto Princesa City is now up for approval and adoption of the Palawan Council for Sustainable Development (PCSD). PCSD is a multi-sectoral and intergovernmental agency created through RA 7611 or the Strategic Environment Plan for Palawan Act of 1992. The 2016-2020 cave management plan was developed and prepared by the PCSD Staff in coordination with the City Tourism Office, Puerto Princesa Subterranean River National Park-Project Management Office (PPSRNP-PMO), Center for Sustainability, Barangay Council of Tagabinet and other concerned stakeholders. In Palawan, there are 94 caves identified from 2008 to 2014. Meanwhile, the presentation of the Hundred Caves management plan was included on the agenda of the 222nd PCSD Regular Meeting on January 28, but the Council has deferred it for further review. Once adopted and implemented, it will prompt the local stakeholders to undertake necessary protection and conservation measures for the cave ecosystem and its surrounding environment. It will also serve as a guide in developing tourism-related capacities of the community, which, in turn, will provide alternative livelihood and generate income for the locals. By historical account, Hundred Caves of Tagabinet was discovered during the 1990s by Bueg Lais, a member of Palawan's indigenous tribe in search for caves in Tagabinet karst areas that possesses edible birds’ nest (EBN). It is a solution-type of cave having an elevation of 80 meters (cave mouth) above sea level. “This cave system is multi-stored and possesses a series of continuous narrow ‘maze-like’ and/or winding interconnecting passages and vertical pitches which are both challenging and beautiful,” described the management plan’s executive summary. 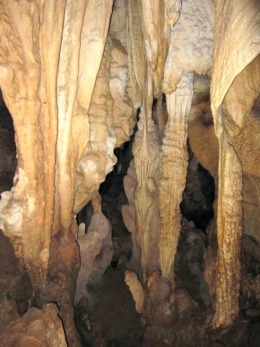 Given its characteristic, Hundred Caves was classified as Class 3. As such, its surrounding area can carry soft impact eco-tourism activities such as guided educational cave tour, cave photography, birdwatching, rock climbing, as well as scientific studies. This “Green Tourism” program for the Hundred Caves, which is anchored on the concept of community-based sustainable tourism (CBST), will also capacitate the Tagabinet Neighborhood Tourism Association (TNTA). As in the experience of other CBSTs in Puerto Princesa, the said program is proven to address both the issues on environmental conservation and socio-economic improvement of the local communities concerned. But Tagabinet also has to consider various elements that the program entails, including the visitation management, tourism infrastructure development, establishment of an equitable income sharing and user’s fee system, and accreditation of tourism establishments, among others. Once operational, it will serve as an additional tourist destination, along side the City Tour, the Puerto Princesa Underground River (PPUR) and island hopping in Honda Bay. Hundred Caves, however, has its fair share of issues and concerns that threaten its ecological integrity. “Reports of lack of governance and enforcement implementation as well as lack of human resources also pose threat to Hundred Caves,” it added.